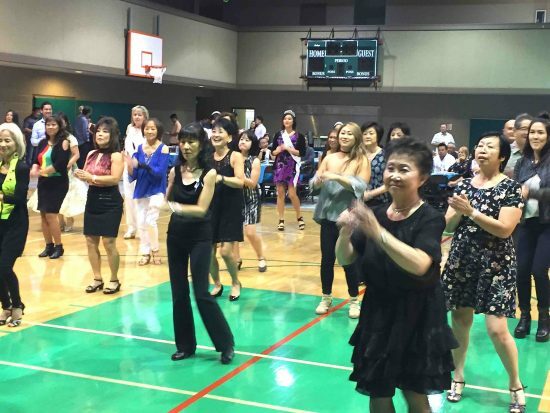 ANAHEIM — Orange Coast Optimist presents Dancing for Miracles VII, celebrating 27 years of bringing hope and creating miracles, on Saturday, Nov. 17, at Orange County Buddhist Church, 909 S. Dale Ave. in Anahiem. OCO’s famous backyard BBQ tri-tip and chicken dinner will be served from 6 to 7:30 p.m. Line dance lessons by Akimi start at 7:40 p.m.
Dance music will be provided by Kokoro at 8 p.m. Actor Aaron Takahashi will serve as master of ceremonies. Guest speaker will be Brandon Ito, founder of My Wish List Foundation. DJ music by Willie Nagami. Photo ops will be provided by Alan Miyatake of Toyo Miyatake Studios. Proceeds benefit Asians for Miracle Marrow Matches (A3M), which seeks marrow donors for patients with life-threatening blood diseases. Outside of family members, th best chance of finding a tissue match for an Asian patient is among people of the same ethnic/racial background. No high heels. General admission, which includes dinner, is $65 per person at the door. For more information, contact Shirley at (714) 797-1600 or [email protected]; Carol at [email protected]; or Laraine at (310) 826-9805 or [email protected] Register online at www.ocodance.org.